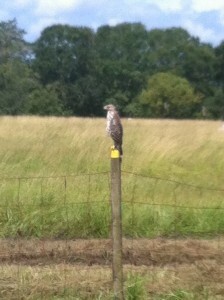 Today, God perched an eagle in our backyard. I was so thrilled to see it and able to take a picture of it so I could share. I walked away for a second and when I went back it was gone. This made me go to the Word of God and see what is said about eagles. This is what I found. I encourage you all today to fly like an eagle. Open your wings and soar. The enemy is a liar and wants you to think you cannot fly high. The enemy wants you to stay perched on the ground. God is saying in Isaiah 40:31 that you can mount up with wings like eagles. Wait on the Lord. Trust in Him. Know He is your Father. Know He will never let you go. Know He is right by your side. Call on Him today and let Him love you. You are precious in His eyes. So I say it again….. get out there and soar like an eagle and fly high.